Recognising R. Sampanthan as the Opposition Leader of Parliament by Speaker Karu Jayasuriuya on September 3 is being viewed by a section of society as one of a series of measures taken by President Maithripala Sirisena to checkmate former President Mahinda Rajapaksa. 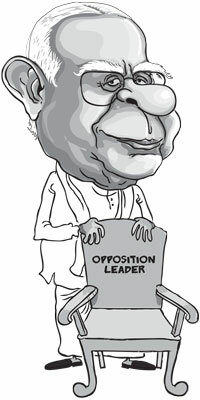 Another school of thought on this matter, though weak is that Sampanthan’s elevation to the top post of the Opposition was just an inevitable upshot of the national government process initiated by President Sirisena and Prime Minister Ranil Wickremesinghe. A third vague theory says that this is a pre-planned move towards national reconciliation.Leaders of the National Freedom Front (NFF), Pivithuru Hela Urumaya (PHU) and the Patriotic National Movement (PNM) who live on theories of separatism seem to be of the view that it was also a pre-planned action by the government to facilitate the Tamil secessionist campaign. The first theory-checkmating Rajapaksa- seems to be a more sound argument while inevitability of Sampanthan being appointed to the post of Opposition Leader as a result of the formation of the national government and the view on reconciliation being its by-products. Describing this as intentional facilitation of a separatist agenda is nothing but a hate-spreading canard. Circumstances created by Rajapaksa through his nepotism, cronyism and highhandedness compelled Maithripala Sirisena to challenge Rajapaksa at the last presidential election held prematurely. After the victory at that election Sirisena’s main focus has always been on the prevention of Rajapaksa’s possible political comeback which he had seen as something that would send him six feet under the ground. The haste shown by Rajapaksa and his loyalists in the Sri Lanka Freedom Party (SLFP) and the United Peoples Freedom Alliance (UPFA) to crown Sirisena as chairmanship of those two parties soon after the conclusion of the presidential election strengthened the hands of Sirisena in this endeavour. They could have amended the SLFP constitution using their majority power in the party’s central committee in order to prevent Sirisena from taking the mantle of both parties. It was vividly evidenced that Sirisena made use of these posts to the core during the latter part of the recent parliamentary election campaign to sabotage the comeback efforts made by Rajapaksa. President Sirisena’s cool and unruffled demeanour must be the deadly in his arsenal of weapon against opponents. It was so misleading that Rajapaksa camp was fooled into believing that they can bring back Rajapaksa to the helm- at least to the premiership - ignoring their party chairman after the famous Nuggegoda meeting held by four miniature political parties with a view to sustain their own survival under the name of Rajapaksa. Sirisena without resorting to Rajapaksa’s highhanded methods just expressed his bitterness saying that if Rajapaksa becomes the prime minister then the Presidency would be within bullets range for him. When the “bring back Mahinda” campaign gained momentum and Rajapaksa loyalists were aggressively adamant to field Rajapaksa as the prime ministerial candidate of the UPFA against the wishes of Sirisena, the latter maintained his cool waiting for an opportune time to strike back like Joseph Stalin’s Soviet troops withdrawing into the interior of Russia when Hitler’s troops invaded the country during World War II until the winter arrived to pounce on the enemy. When he felt that the right time had come, President Sirisena struck back with an address to the nation and an open letter to Rajapaksa and by suspending the two secretaries of the SLFP and the UPFA. Being staunch supporters of Rajapaksa, the two secretaries, Anura Priyadarshana Yapa and Susil Premajayanth had been gradually undermining Sirisena’s authority within the SLFP and the UPFA. However, Sirisena misled the Rajapaksa camp by not taking action against them until the last week before the election. President Sirisena’s guerilla attacks brought in results by way of dashing Rajapaksa’s prime ministerial hopes at the August 17 general election. In spite of the Rajapaksa loyalists’ visible submissiveness after their defeat at the general election, President Sirisena seems to be determined to close all possible avenues that might enable Rajapaksa at least pressurise him and he rushed to prevent anybody from the Rajapaksa camp from becoming the leader of the Opposition. Rajapaksa had already recommended one of his ardent loyalists, Kumara Welgama for the post. Fifty- five out of ninety- five UPFA parliament members in the new Parliament had requested the president in writing to appoint Welgama to the post. However, the leader who has been preaching “yahapalanaya” or good governance since the first day of his presidential candidature of the common opposition last November ignored the internal democracy of the party in order to go for a national government with the UNP, paving the way for a Tamil to be become the Opposition leader after 32 years. Hence Sampanthan, in a way must thank Rajapaksa for his new post. The opposition or reservations expressed by some quarters of the Tamil leader who some six years ago recognised the LTTE as the ‘sole representative of the Tamil people’ being appointed the Opposition leader is not totally unfair or unfounded, given the chilling reminiscences of the behaviour of the first Tamil Opposition Leader, Appapillai Amirthalingam. Against a backdrop of a beginning of an armed struggle for a separate Tamil state and a separatist mandate he got at the 1977 General Election Amirthalingam used the post to the hilt for the promotion of his secessionist ideals. It has been reported that the LTTE had typed the first letter claiming responsibility for several killings at the Opposition leader’s office in Parliament. However, apart from the absence of a separatist armed struggle the present-day main Tamil party seems to be reformed. They now call for a solution to the Tamil issue within a united Sri Lanka. The latest goodwill gesture by them was their stand on the demand by certain Tamil leaders for an international investigation into war crimes allegedly committed by the Sri Lankan armed forces. Last Sunday Mavai Senadhiraja, one of the leaders of the top TNA berated his own party colleague, the Chief Minister of Northern Province C.V. Wigneswaran calling for an international probe. He argued that the UNHRC had already carried out an international investigation and the report was to be presented at the UNHRC sessions this month. Hence the country has to patiently watch the events to be unfolded in spite of the rhetorical comments by Tamil leaders, because rhetoric is an inseparable feature even in southern politics.